So yesterday was my birthday and being a holiday (Holy Friday) I figured everything would be closed. To my surprise not everything was and we ended up at Cocina Abierta in Condado. Thank the #culinarygods! This place was phenomenal. The concept is different to your typical restaurant. The menu is divided in 4 acts with small servings with the sole purpose that you order several items and try more than one thing. The portions are just right: Big enough to share, and small enough to order 2 or 3 items. Since it was my birthday, I did not go stingy. We ordered a plate from each act and dessert. Oh boy! I’m going there again. Act II: Seared Scallops (Sorry, no pic). Desserts: Make sure you leave room for it! For kids and nature lovers! 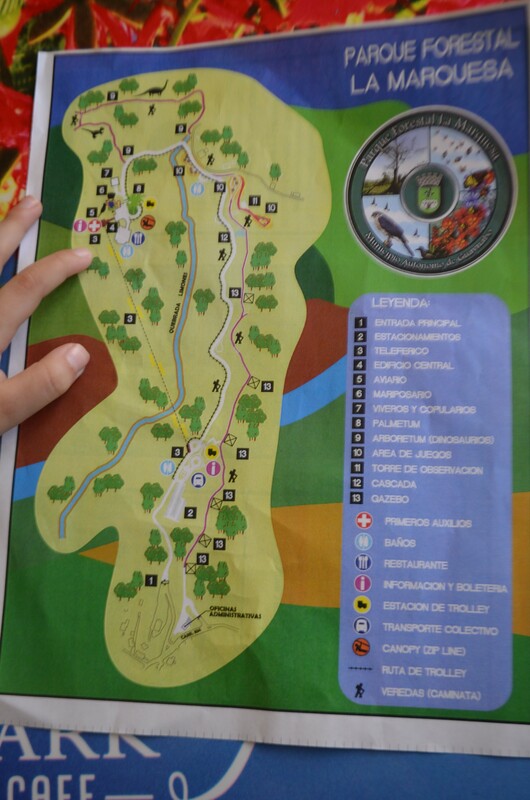 Only a short distance from San Juan, La Marquesa Forest Park is a great spot for families and nature lovers. The park itself is a beautiful forest with added extras. Kids pay $3.00 and adults $6.00. They have limited parking space, however, there is extra parking below the mountain accessible via trolley car. As you go in the park you can either walk up the mountain, take a train (car that looks like a train) ride or ride the cable cars. I recommend the cable cars. The view is spectacular, and frankly, the mountain is pretty steep so it’s a break from hiking. You can go down on the cable cars as well. They also have a train that takes you up the mountain. Either route, you end up in the aviary and restaurant area. We ate and skipped the birds. The kids wanted to see the Dinosaurs! It’s really a trail with commemorative trees and dinosaur sculptures; a very steep hike, but alas, there was T-Rex. They have small playgrounds with gazebos scattered beyond the dinosaur trail. There’s a watchtower. The view must be amazing. Frankly we didn’t go up. All of us were tired from the dinosaur hike! We walked back down the mountain through the back trail. Nobody was there! A beautiful forest path, just for us. There were gazebos all along the path where people can get together for a picnic or simply rest from the hike… The path continued beyond the park entrance, but as our car was parked near the entrance, we went up the stairs and ended our hike there.